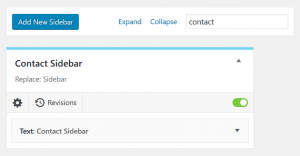 At the core, the sidebars you create with Content Aware Sidebars are no different than any other sidebar in WordPress. This means you can add or remove widgets just like you’re used to – with some improvements. Navigate to Appearance > Widgets. Sidebars created with Content Aware Sidebars are easily identified with a blue line. When you click to expand one, you’ll see it’s Action and Target Sidebar in the description and the options Edit Sidebar and Widget Revisions below. You can activate and deactivate sidebars with one click, which is very useful when staging important changes to widgets. Sidebars and Available Widgets can be filtered by keyword, meaning you can save time and focus only on the relevant ones. And if you want to get a quick glance of all widgets added to your sidebars, just click Expand in the toolbar. Good to know: You can add and remove widgets no matter if the custom sidebar is active, inactive or scheduled. If you’re used to manage your widgets in the Customizer, you’ll be happy to know that Content Aware Sidebars supports that too. 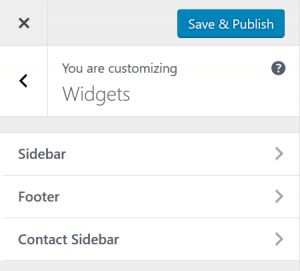 Open the Widgets menu in the Customizer and start navigating around on your site. The Customizer will list the sidebars that are active on the current page, so you can get a live preview when adding or removing widgets. A sidebar you have created with Content Aware Sidebars will show up in the Customizer when you’re browsing a page where it’s conditions are met. Remember to click Save & Publish when you are done.